The Orbi-Shaker XL high capacity orbital shaker offers flask capacity that far exceeds that of most benchtop models. With a large 450 נ450 mm platform and a powerful beltless motor drive, the Orbi-Shaker XL is capable of mixing up to five 2 L flasks or nine 1 L flasks simultaneously. 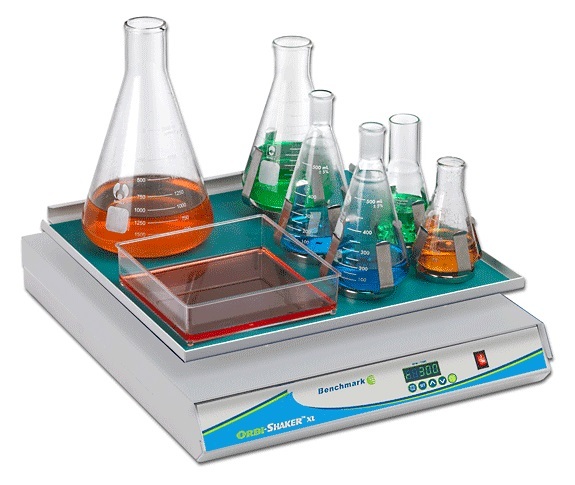 The standard platform that comes with the Orbi-Shaker™ XL has a flat rubber mat, ideal for use with tissue culture flasks, Petri dishes, staining trays and other flat vessels and lower speed applications. 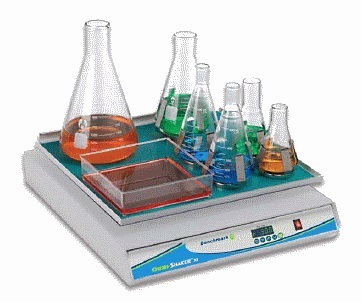 The available convenient MAGic Clamp٠Universal Platform is for use with Erlenmeyer flasks and test tube racks and is ideal for high speed mixing. The unique magnetic MAGic Clamp٠attachment method is the easiest way to instantly change between flask clamps of different size. The MAGic Clamp٠allows for instant flask clamp exchange without the use of tools, screws or any other hardware.